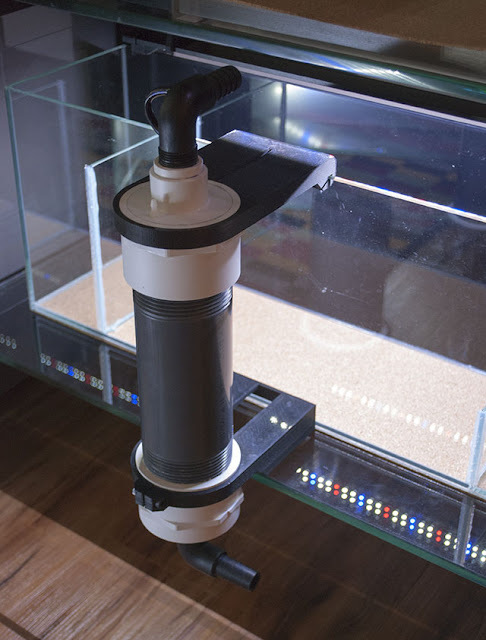 Drilling an aquarium is only half the job, because an uncovered hole will simply drain all the water from the tank (not fun for your floor or the fish). 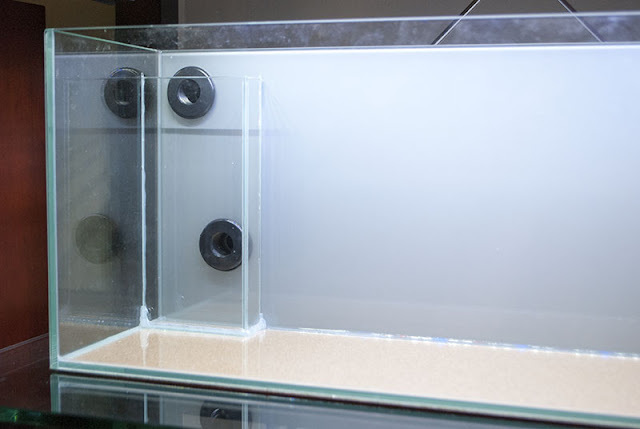 A glass overflow box is often built around the drain holes so that a constant water level can be maintained. 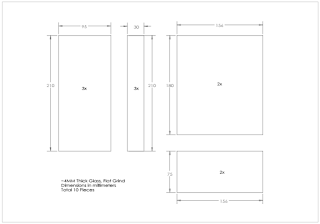 I drew a cut list for the glass I would need and requested quotes from two companies: a discount repair shop and a proper architectural firm. They provided quotes of $80 and $240 respectively. I went with the cheaper option but they did not provide the requested edge finish and the squareness on a few pieces was questionable. 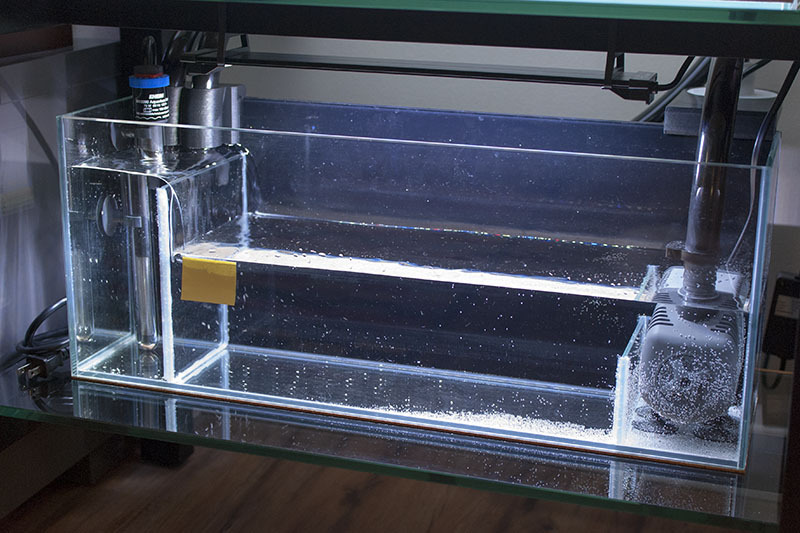 Since the tanks are small I kept the overflows extremely small as well. They protrude only 30mm from the back wall, which will block the plumbing from being removed without cutting out the overflow. 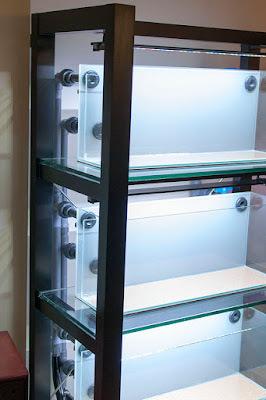 On the other hand, they consume almost no tank space and should be easy to hide. 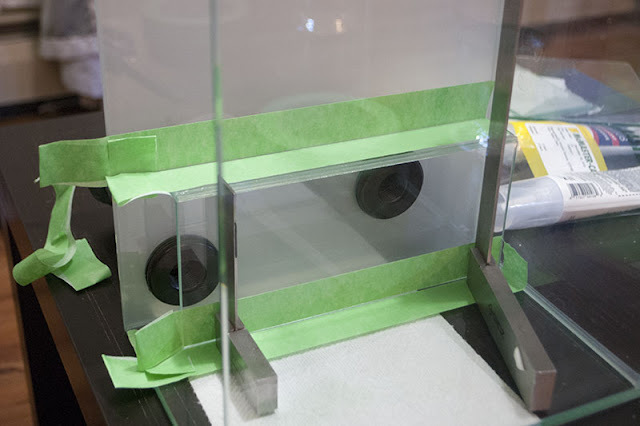 It seemed easiest to glue the overflows together before installing them in the tank, so I started by applying tape to the edges. 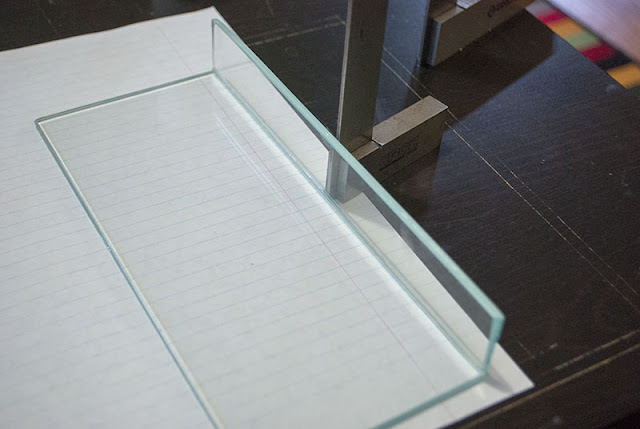 It is important to carefully mask the glass if you want to produce a neat join. I then applied a bead of aquarium safe silicone and pressed the two pieces together. Excess silicone will squeeze out of the joint and can be scraped away. 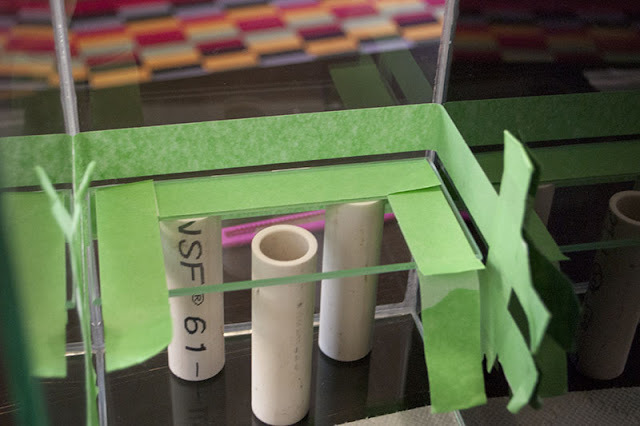 Finally, the tape should be removed after the silicone has set but before it fully hardens. 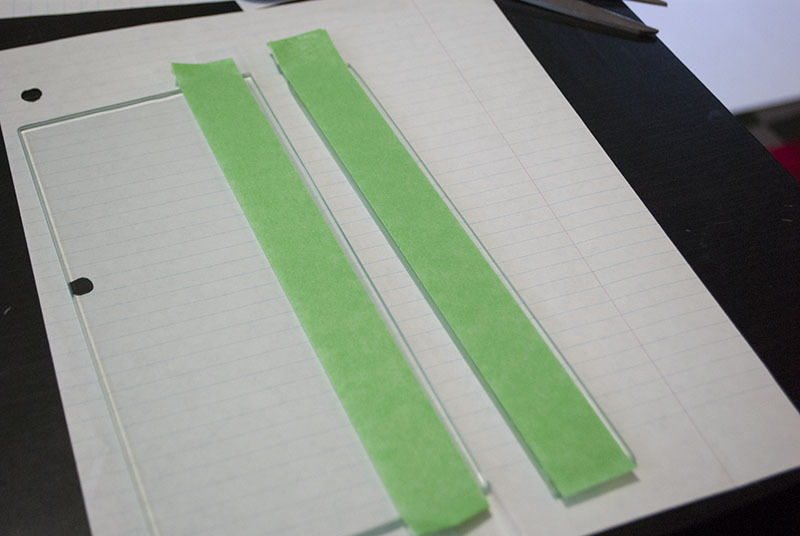 If you leave the tape on too long the silicone will form a skin over it and become hard to remove. 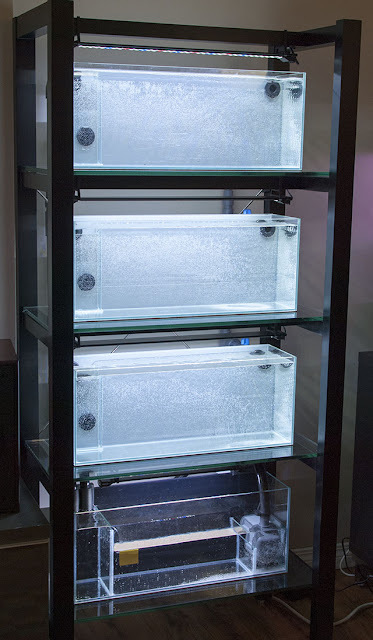 After the silicone had cured I prepared to install the overflows in the tanks. 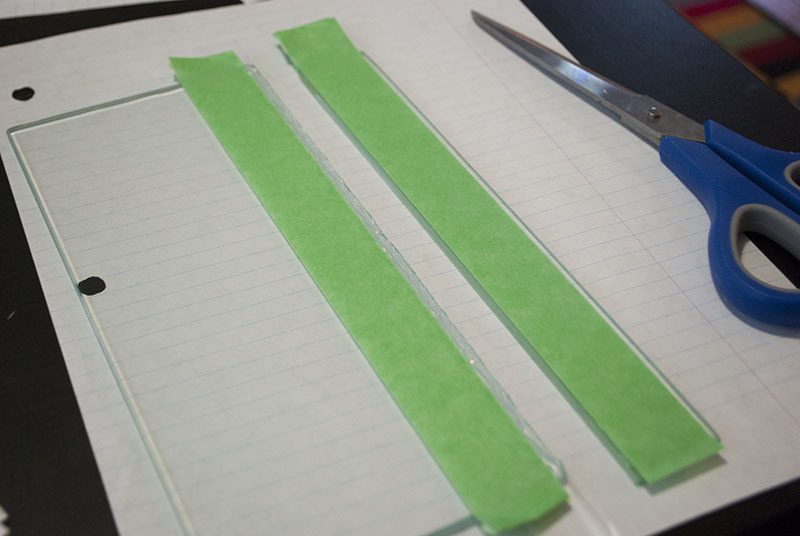 It is harder to mask these joints because the overflow is so small, but I did my best. I let myself be messier when sealing the bottoms of the overflows because they absolutely cannot leak and will be hidden by substrate. I installed the sump baffles in a similar way. 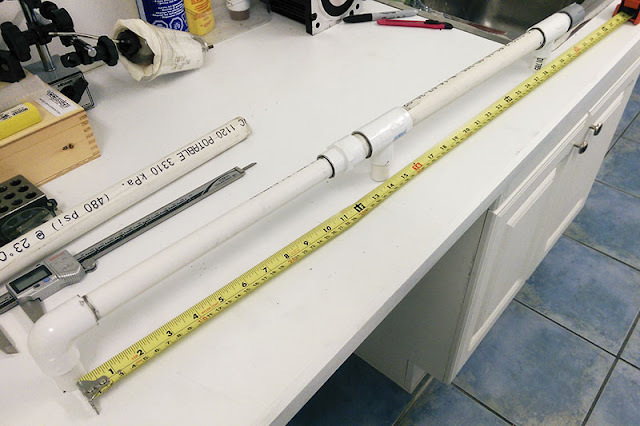 First the area around the connections was masked with tape, and then spare pieces of PVC pipe were used to hold the baffle in alignment. 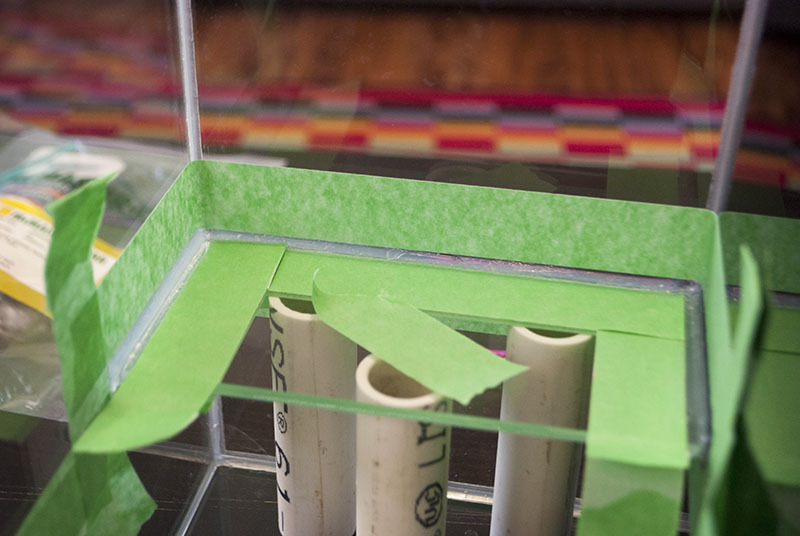 Most guides recommend leaving 1/8" of clearance on each side of the baffle, but that turned out to be way too much room. 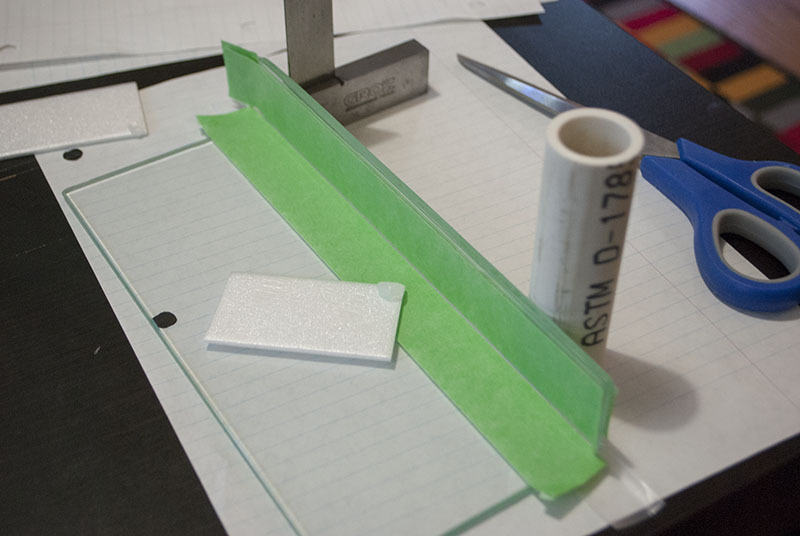 I filled the gaps with a generous dose of silicone and then chamfered the excess with a small card. 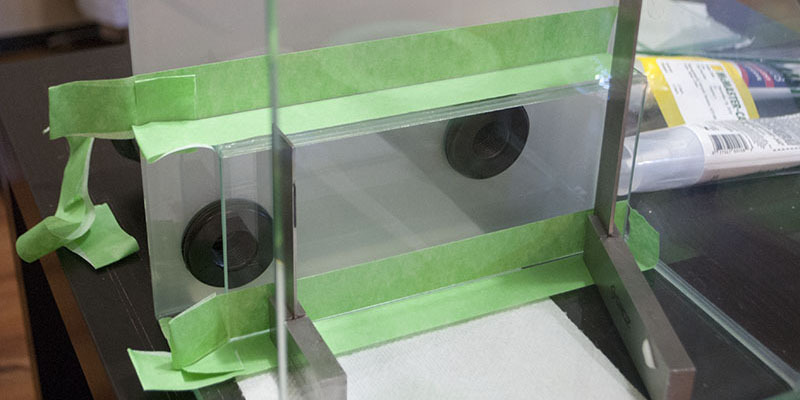 Under close inspection its pretty obvious that the baffles were not as cleanly executed as the overflows, but both constructions still look acceptable. Next I made the return and drain lines that connect all four tanks together. 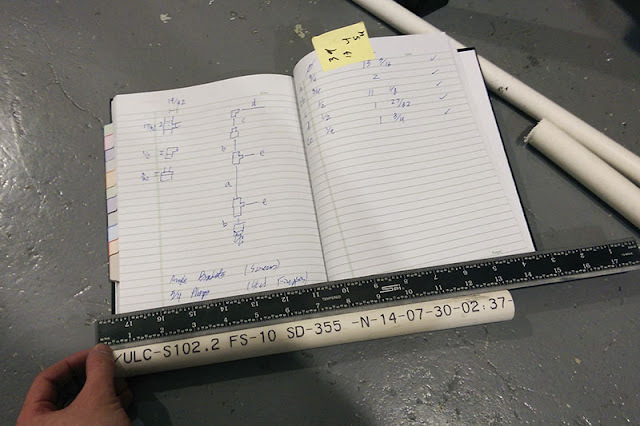 The shelves of my bookcase are spaced exactly 14 1/4" apart, so I did the math to come up with a cut list that would match the positions of the drilled holes. 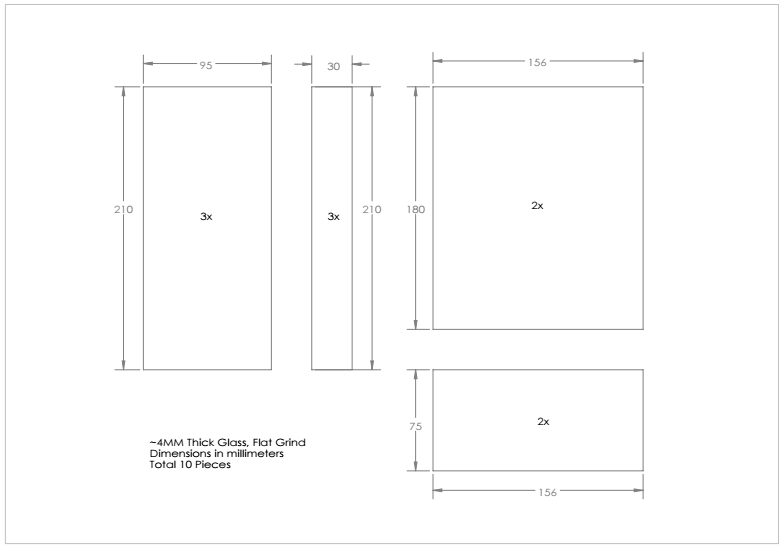 Fitting dimensions are in fractional inches which is quite annoying. 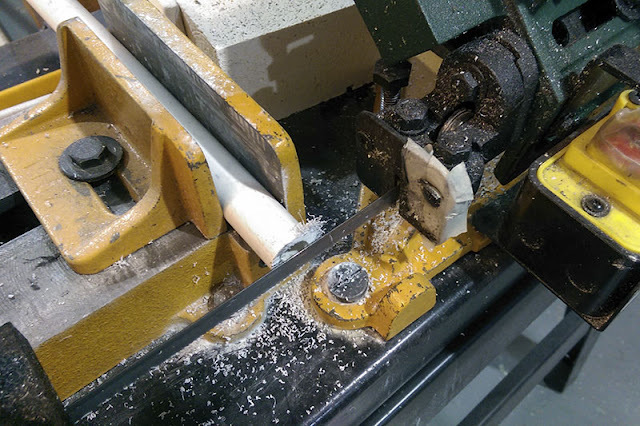 The pipe was cut on a horizontal bandsaw as it is the only powered saw I have. The cuts were nice and square but had a nasty burr. 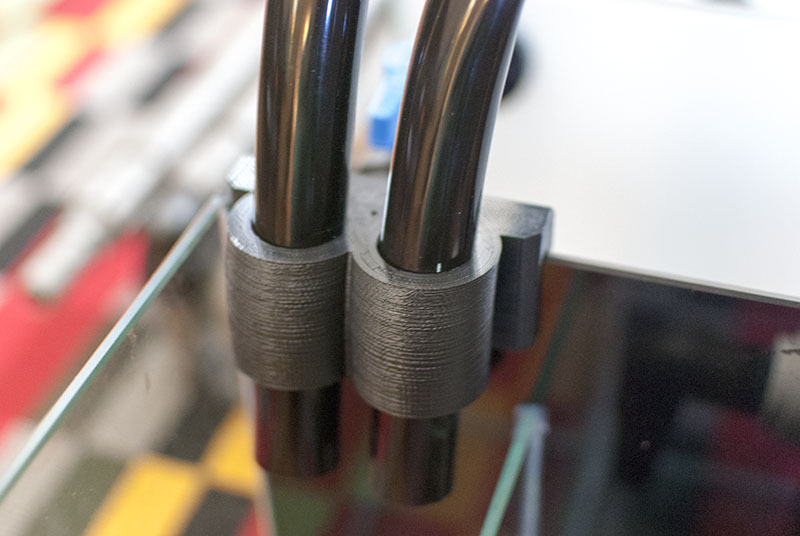 It is very important that every connection is fully seated or the unions won't align with the shelves, so I cleaned up the pieces with a file and deburring tool to make final assembly easier. 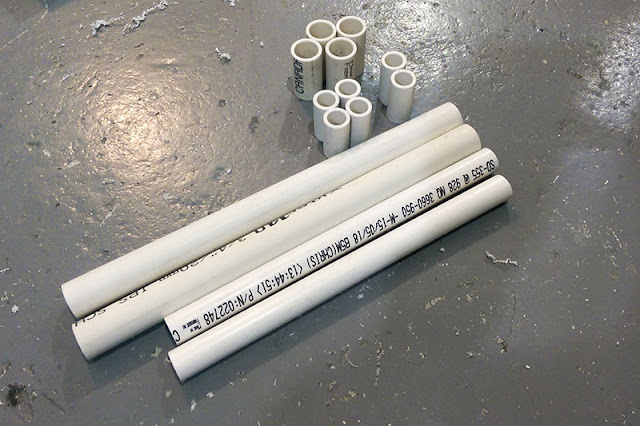 Here are two complete sets of pipe, I will need three sets in total. 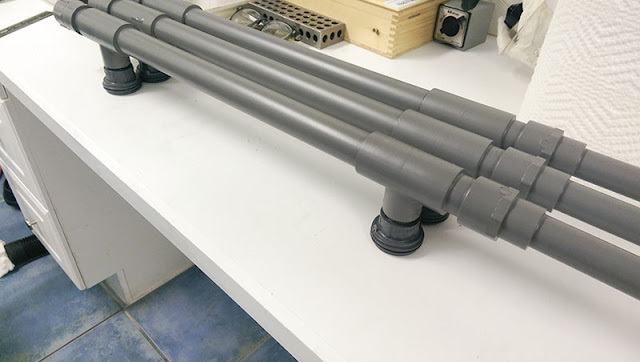 I was nervous about gluing these assemblies together since the large fittings I used earlier had been difficult to seat, but the smaller schedule 40 fittings went together effortlessly. 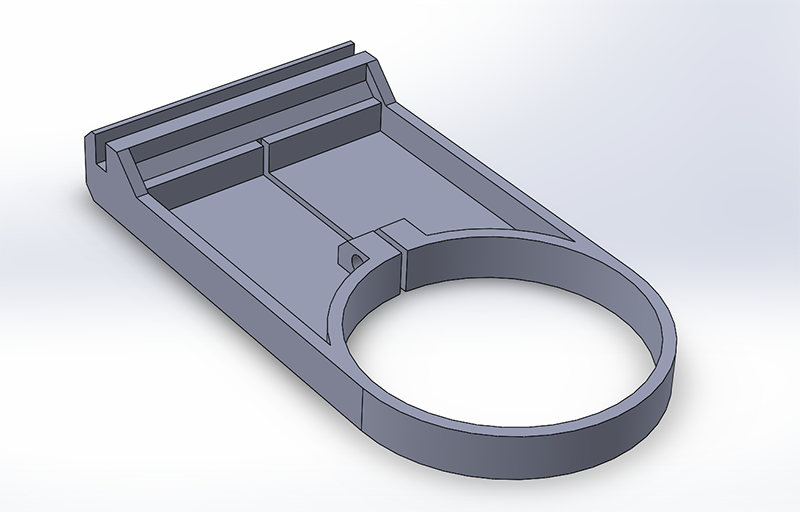 After confirming that the tees were correctly spaced, I assembled the other two drain/return lines. 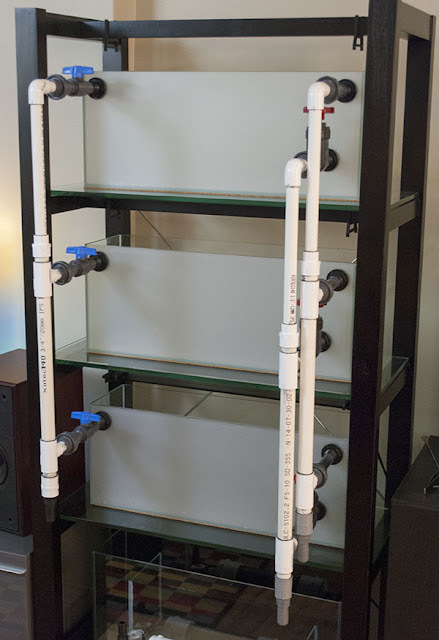 The drain/return lines must still be painted grey before final installation, but I couldn't resist turning the aquariums around to try a test fit. 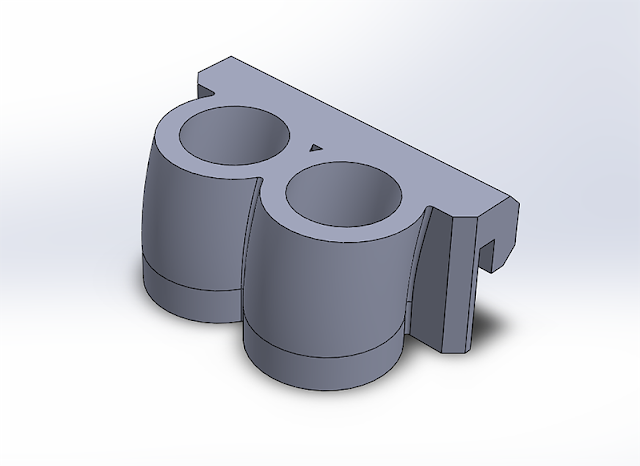 As a small diversion, I prototyped several designs in CAD to discretely mount the various pieces of equipment that will support the aquariums. 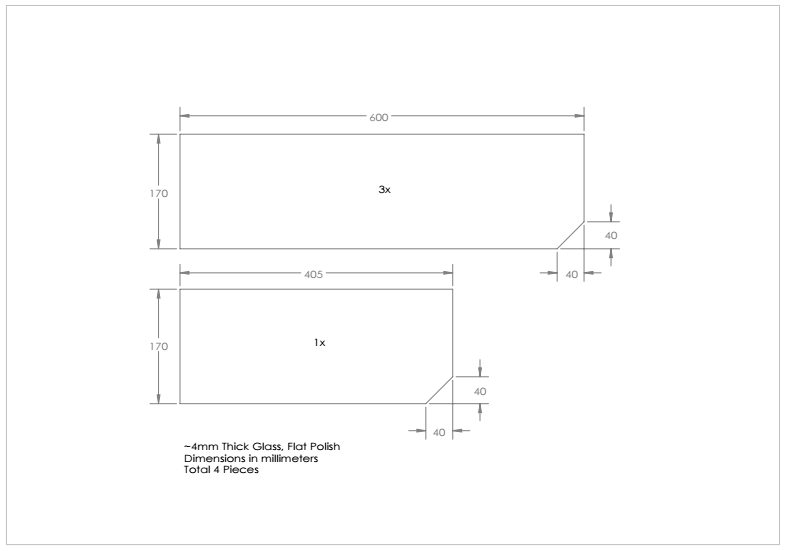 The design applies the weight of the reactor to the shelf below the tank. The top piece is only used to keep the reactor upright. 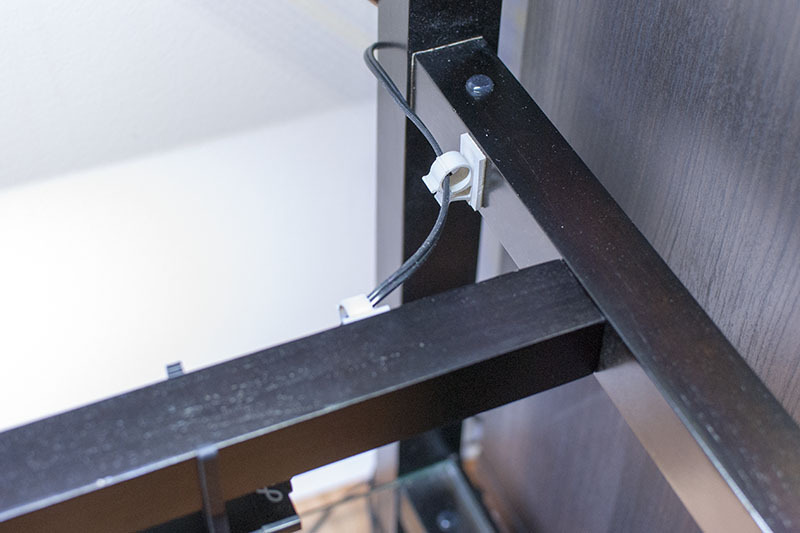 I also took the liberty of attaching some adhesive cable holders to keep the wiring discrete. 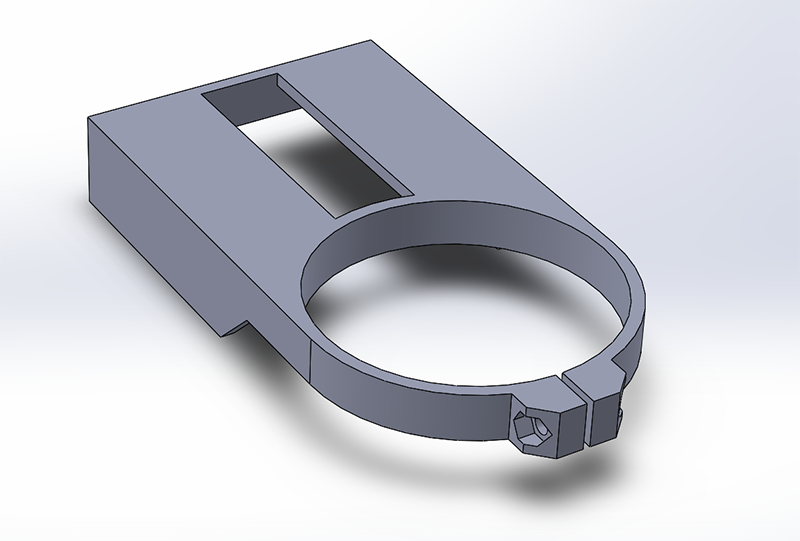 I like this style of clip because they can be opened and closed at will. Here is a shot of the reactor in its final position. 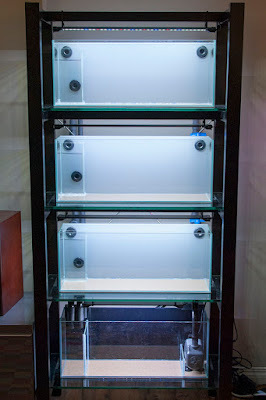 The center of the tank will be lit and used as a fourth display area, while the dark sections on each end of the tank will house plumbing and equipment. The next part to be printed was a small clip to keep the return lines in place. This print hooks onto the back of the aquarium and will eventually hold two lengths of vinyl tubing in place. After printing the reactor and return mounts, I finally returned to painting the drain and return lines. I used a grey spray paint designed for plastic and it produced an attractive satin finish. 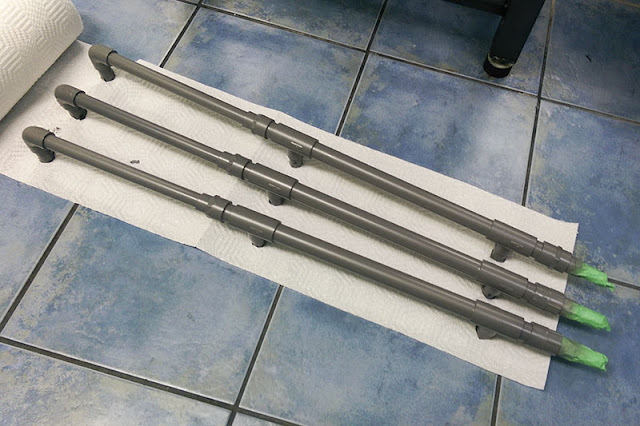 I chose to install the unions after the paint had been applied as they are already grey and have some critical mating surfaces that should not be painted. 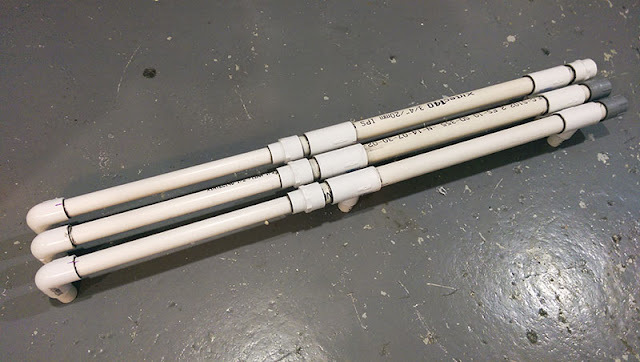 Their connection points were masked off so that they could be glued to untouched PVC. 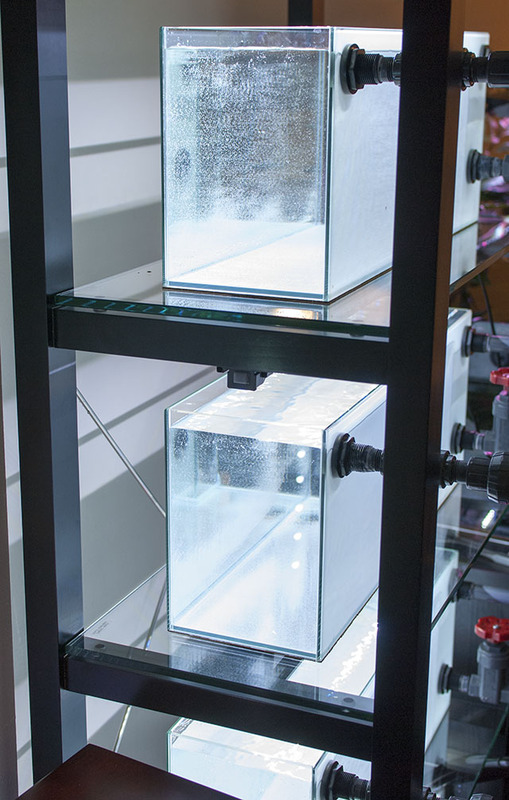 The first water test was done with the aquariums facing backwards. 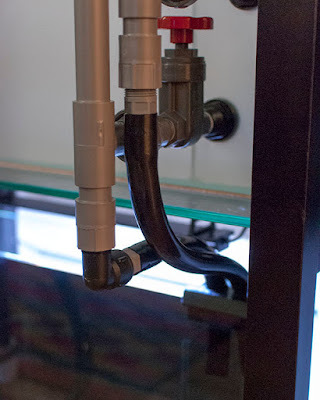 Having full access to the plumbing made assembly easier, and will be very useful if I need to track down any leaks. 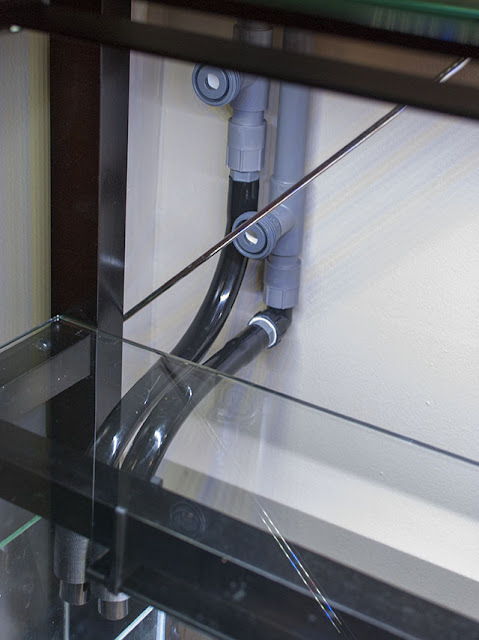 The last few inches of the return lines are connected to the sump with short lengths of vinyl tubing. The flexibility of soft tubing made assembly and alignment much easier than an exclusively hard-pipe design. 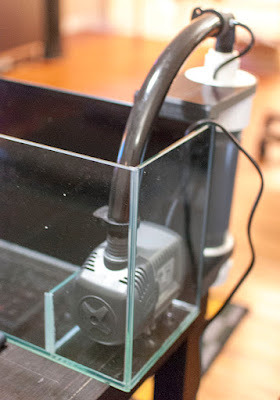 The pump is also connected to the reactor using vinyl tubing. 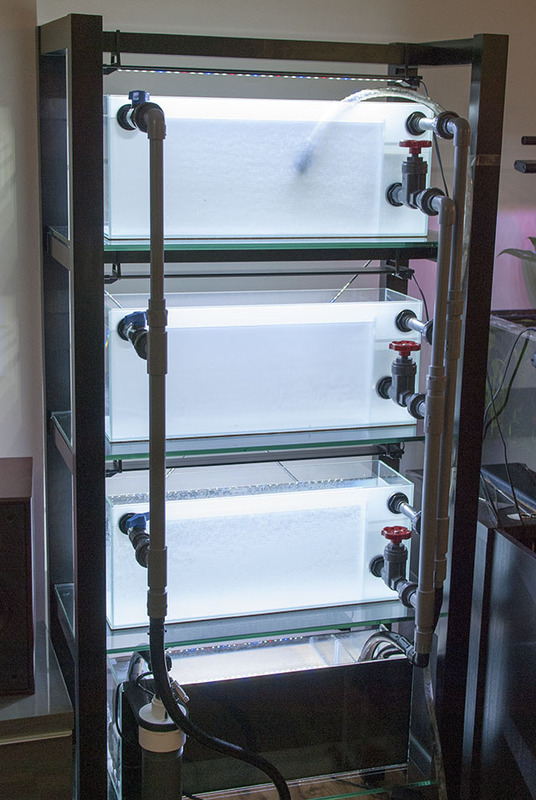 In total the plumbing system for this set of aquariums contains over a hundred connections which can potentially leak. Filling it for the first time was nerve-wracking. I'm not sure if it was luck, skill, or the magic of modern plumbing sealants, but the system worked on the first try! You can see slight ripples in the tanks being created by the pumps flow. Assembling the system with the tanks facing forward is more of a challenge, but still straightforward if performed in the correct order. 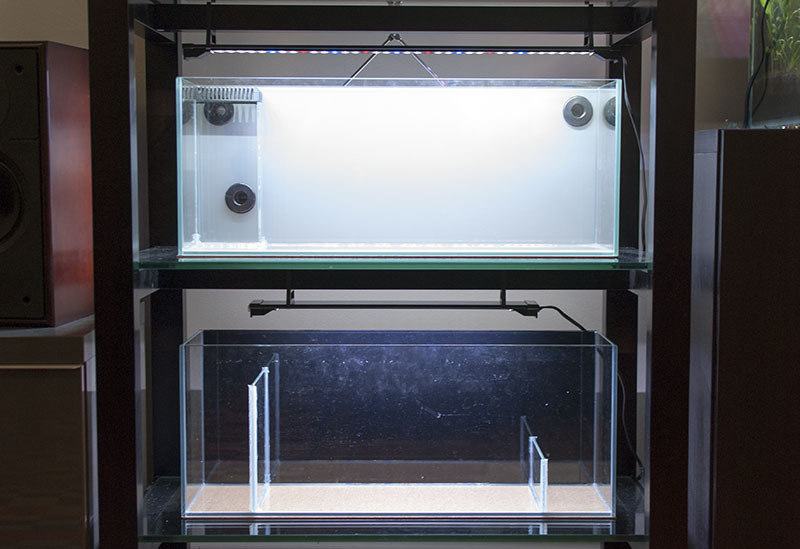 The trick is leaving one display tank out so you can access the return lines, and finally slip it into place at the very end. 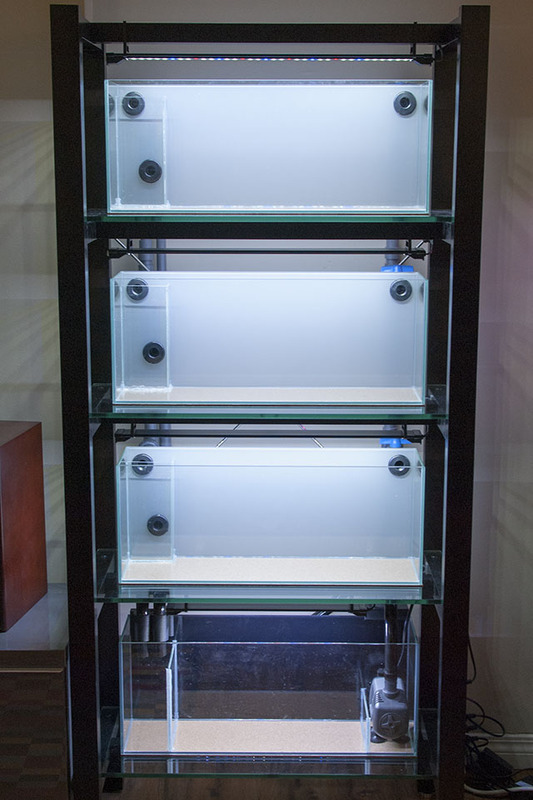 The tanks are much smaller than the actual shelves, so there is plenty of room to reach around and tighten the unions even with the aquarium against a wall. 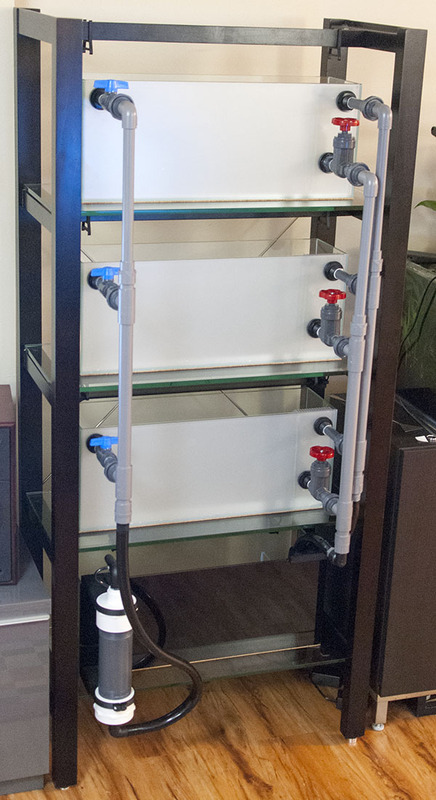 There are six valves in total which can be adjusted to control the flow rates and water levels in each tank. 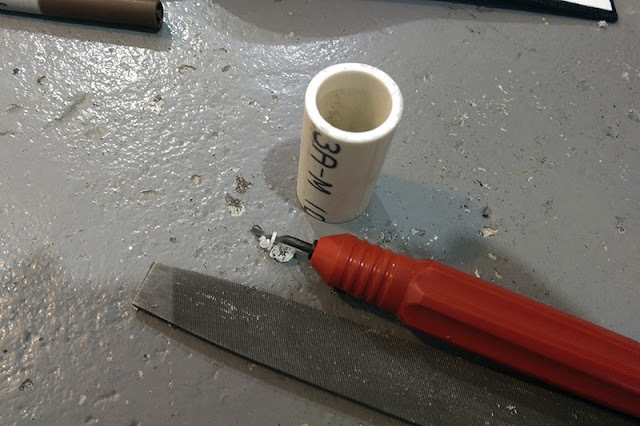 The dual drain arrangement I have used provides a considerable margin of safety, but requires some tweaking to run completely silently. When I initially started this project there was considerable skepticism as to whether it would work as expected. 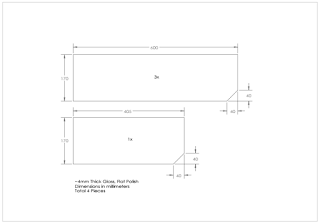 As far as I am aware it is the first design incorporating a siphon between tanks at different heights, and teeing return lines is highly discouraged. It has, however, proven itself to be very reliable over time. 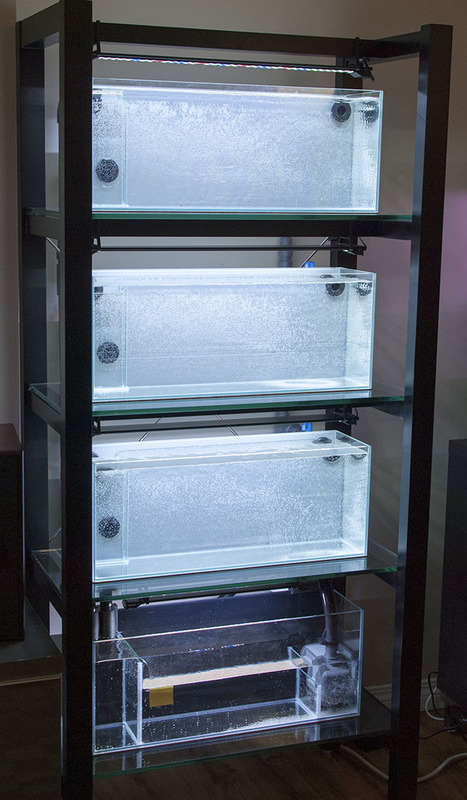 Here is a final close-up shot of the bottom tank which houses equipment for the rest of the system. This setup is rather minimalistic as contains only a heater and pump, along with an external reactor hanging off the back. 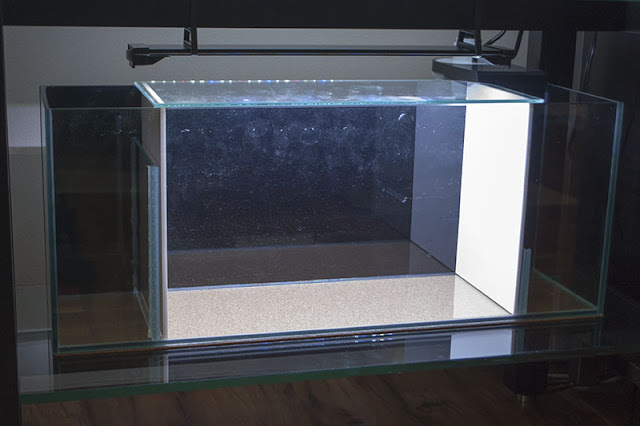 I will later add a small amount of filter media to this tank, but I will be relying on aquatic plants to provide most of the filtration. 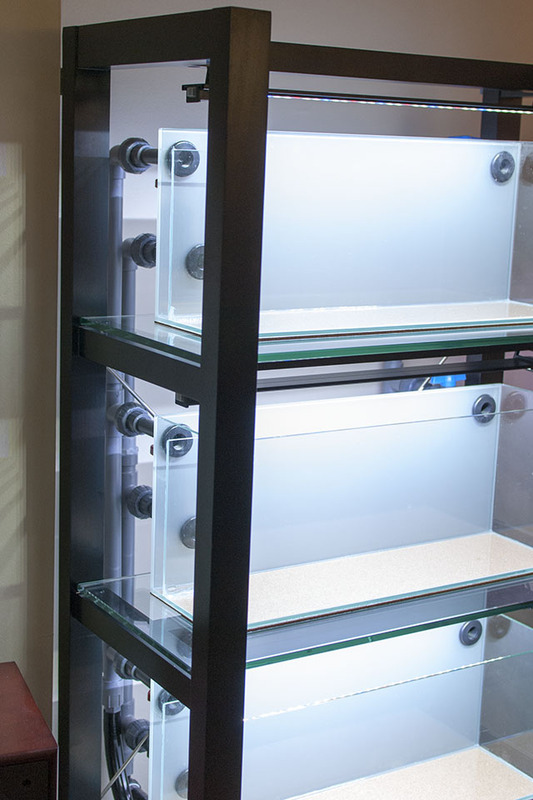 The Bookshelf of Aquariums is now operational, but I have many more ideas to implement before it is complete.